It has been so very cold here the last few days with highs ranging from 18-22 degrees and lows too low to recount. It makes for an amazing excuse to stay in, get delivery, and drink hot cocktails! As it turns out bourbon goes great with a little lemon, some honey, and a cup of hot chamomile tea, I suggest settling down by the fire with a mug of that, although you may not get up again for the night. Money saving tip: The more bourbon you drink, the lower you can keep the thermostat! 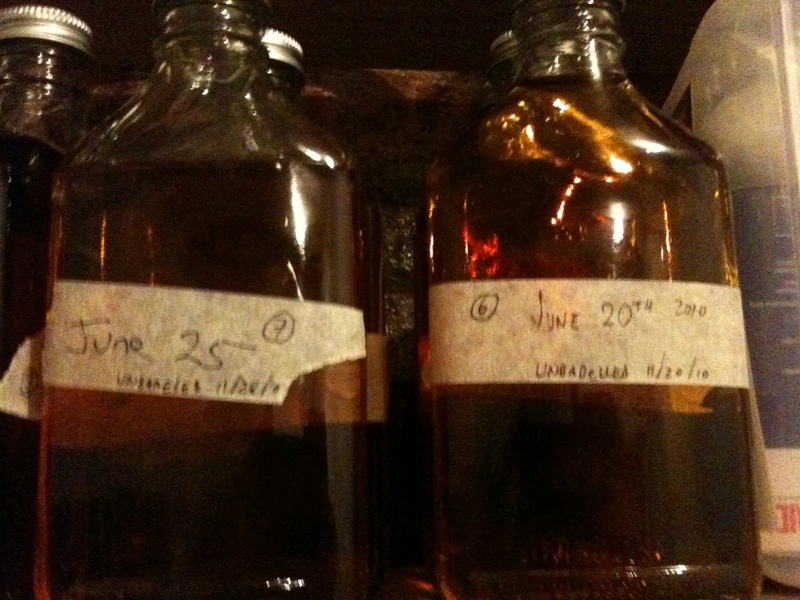 After quite the wait we finally have un-casked the second round of bourbon at the distillery. Having bottled a new batch of hand picked barrels we now have something to actually gauge our progress as all of us at Kings County learn our way to the ultimate bourbon. We knew that the last round of bourbon we put out, our first ever, was going to be something that we had no control over. Although it came out incredibly successful for having no idea what we were producing, there were obviously things about it that we needed to tame i.e. the intense and somewhat over bearing pine scent and flavor or the the cloying sweetness that was way too rounded and overwhelmed any of the sharp bite. Being so young, and frankly so ignorant, as a distillery we are learning to tackle problems and improve our work in order to better our bourbon. It boils down to a few different sets of ideas that we are constantly evolving the first being efficiency: trying to make sure we are doing every process the best and most efficient way, and the second: trying to actually influence the flavor of the end result. Making things run more efficient is by far the easier task, it is easy to recognize what we need to do to improve a certain system or how to cut back on waste, and easy to quantify results as they are so visible. Taste… Taste on the other hand is so hard to wrap your mind around. Not only do we have to establish what we are going for, which has become very apparent is very different for every single person involved, but also how to get to that different taste. How do we make a better tasting bourbon? It ranges from the consistency of how everyone works to the cooper that produces our barrels; some things we have control over and somethings we can’t avoid. Keeping all of this in mind, this week we handpicked from all of our aging casks the set of barrels that we balance each other out to achieve the results we wanted. Each barrel we fill ages completely different then the next all showing different qualities, one being sweeter and another showing strong cinnamon flavors. 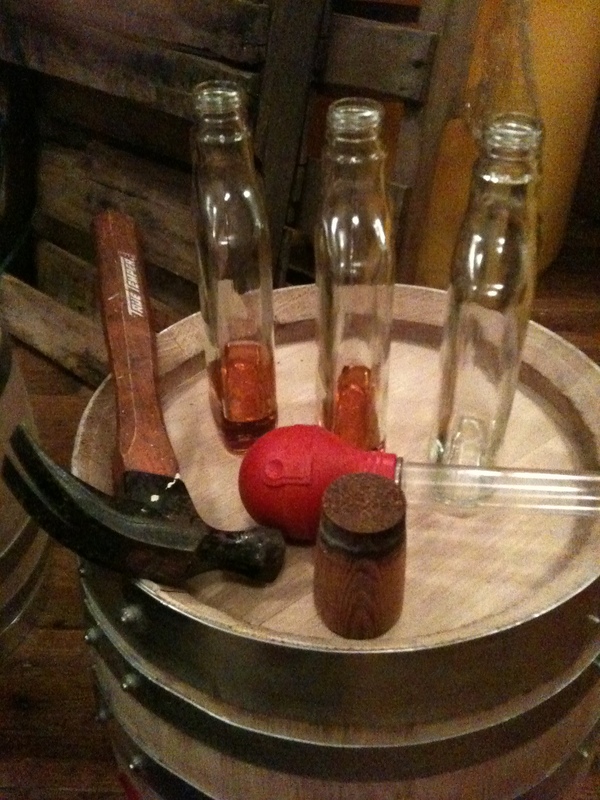 It is our job to select the barrels that will come together to make a whole and complete palette. So after cracking open the 10 barrels that were aged to maturity, we hand selected 3 to bottle this week, and I think the results show. It was unanimously agreed upon that this bourbon was leagues ahead of the last, and I can only hope that we continue to see it progress from here. There are three frames sitting in our hall closet waiting to be filled, and finally they will be sated. 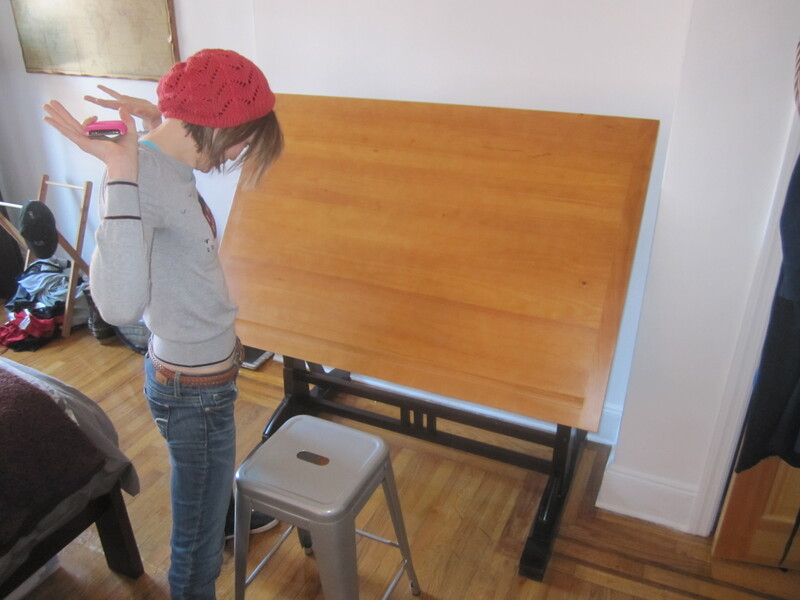 The fine gentlemen from Restoration Hardware dropped off a new drafting table for the house today which I am extremely excited about. 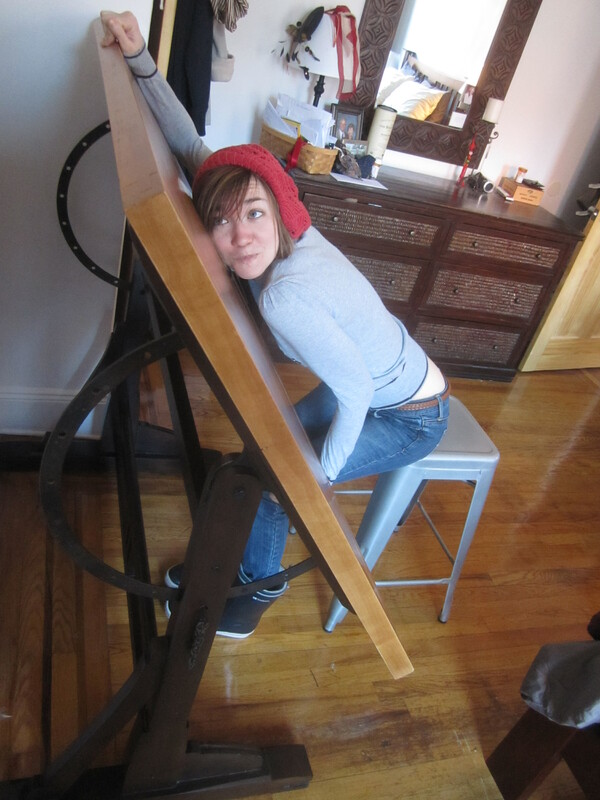 Finally Shannon has a legitimate place in the house to sit and draw. Hopefully over the next few weeks I will begin to our walls fill up with beautiful graphite renderings! After sitting at home for the last 4 days… wooo…… I have created a new Tumblr blog in order to catalog all of the cool things I stumble across on the internet. Nothing overly exciting, just a catalog of randomness to keep me interested throughout the day. You can find it here: http://twilley.tumblr.com – or – by clicking the link on the right side of the page under the links section. Now I am off to retire to the couch to watch more ridiculous movies on Netflix and sip on a fusion of bourbon, honey, and hot chamomile tea! ‘Lumber-Chic,’ the new phrase coined by the infamous Shannon Tebay describing her look of the season. 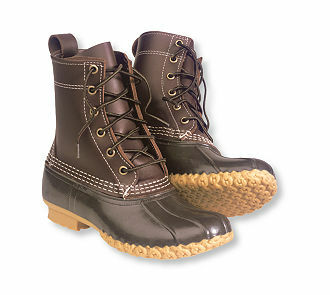 Stemming from the new LL Bean duck boots which she has recently cemented her self into and heading up to her fashionable winter leggings, onward to her understated flannel plaid shirt, and capping off at the timeless hand knit beanie. Lumber-Chic. This winter is going to be the winter of the LL Bean boot as our household has decided to be sponsored by the iconic boot, each of us sporting our own variation from Bison leather to shearling lined. I have encountered more then a few problems getting a hold of mine, as per usual the boots I ordered in my normal size were perfect in length and as wide as they are long. I would love to meet all of these people that clothing companies think are roaming around at 6’6″ and 450 lbs. It should be noted to all of the clothing designers who are obviously reading this: Tall people do not equal wide people. If anything most are stretched out and skinny then your average 6′ bear. As I recover from the flu, Addie from a cold, and Shannon from a tooth ache it came to our attention that finding a doctor is difficult. One of the hardest things we have had to do out here is find healthcare providers! Finding a reliable doctor who we like and trust, not to mention takes our insurance which we may or may not have at certain points, is extremely challenging. We have seen a few over the last year for various reasons from physicals to sinus infections and have yet to be impressed. If you have any advice on locating good doctors let us know! The NYC Crew are headed home for the holidays in under a week! All of us are very excited to get back to NM to see everyone and get some fresh air and clear skies. It is hard to believe that Shannon and I have been gone for a whole year. I feel like time has flown, and it has been the longest year of my life at the same time. It might be time to do a year in review on the blog. Anyways, this was just a quick update to let you all know that we are still alive and kicking. Everything else seems to be marching right along, the distillery has recently been featured in a flood of publications ranging from Newsweek to The New York Times to GQ and many more. 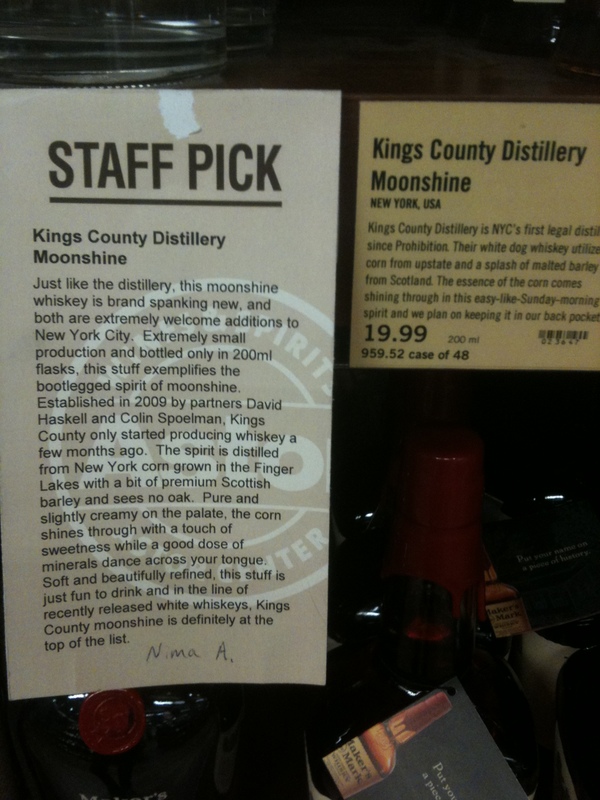 It’s fun to see your stuff on the shelves at stores and think I actually made that very bottle! I will be bringing tastes home for anyone who is interested! I hope everyone is doing well this holiday season! Much love from NYC. It’s taken almost a whole year and a trip away for me to really start to come around to living in New York. Up until this point I have enjoyed my time in this and have attempted to gain every possible experience that it had to offer, but I haven’t quite been able to commit myself to being a part of this city rather than just a visitor. The last three nights this week I have found myself wandering through cold empty streets very very late at night, and during the quietest time in NYC when the early morning cafe owners and the late night bartenders hand off the baton (I actually high fived a cafe owner opening his shop on my walk home the other night at 5 AM) my high regard for this city has emerged. It is an odd sensation when you walk down a street where hundreds of people live and feel like it is YOUR city, but finally I feel like I might actually live here and not just vacation here. It is amongst the cold but festively decorated streets of the East Village that I am finally feeling at home. aged for 2 years I am not sure it can technically be called bourbon. As it turns out we can produce a respectable product! Cinnamon, clove, slight citrus all abound on the palate of our new amber colored creation! Simply awesome! With production fairly limited at the time and a little bit of a learning curve built into our recipes I will wait to share it with you all, but if you are a bourbon/whiskey drinker and would like a taste please let me know! I am very excited about this and I think it will be a huge time for the distillery! I finally left the city for the first time (minus the cabin fiasco) for a relaxing trip to Reno, NV to see our good friends the Freyers as is required by Thanksgiving tradition. What an amazing thing to have fresh air in my lungs and blue skies above me! After years of living in Albuquerque it was a reminder that my body was tempered at high altitude, as both my sister and I commented of how natural the thin air felt versus the thick seaside air of NYC. As far as the trip went, what could be better than consistently having a productive morning at the gym and around town and then retiring by 3pm to the living with with a bottle of wine! It was a much needed getaway, and their will be a much more in depth post about the week long affair. The weather here is actually promising to get cold and wet as it should be, rather than the eerie balmy warmth it has been, and so I wish you all a cold winter season with a warm hearth to curl up next to! 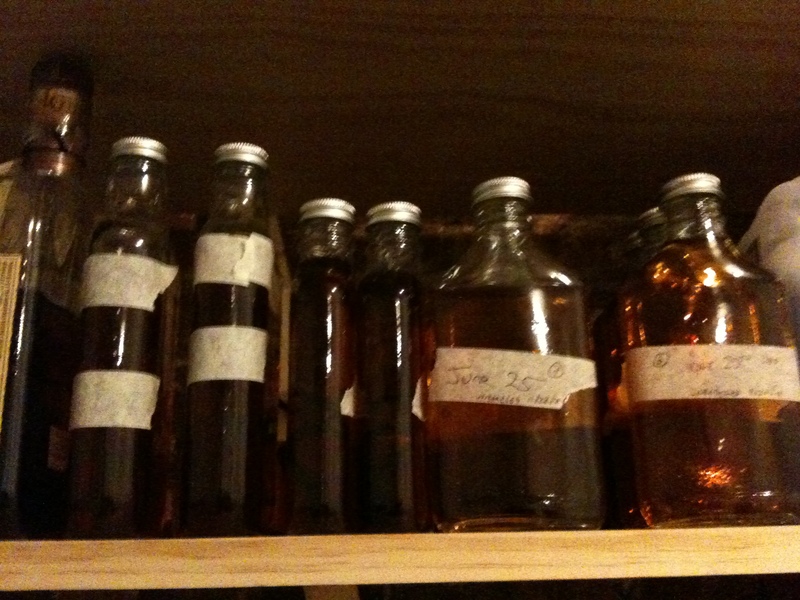 When I talk to people about working in a distillery they all seem to have the same response, “I have always wanted to know how it works.” After spending some quality time crafting bourbon batches, I can now confidently give you a run down on what it takes to make a batch of booze. So here is some insight into the not overly complex process which I have been spending day and night working on. I first learned the process physically, simply recreating what my co-worker showed me, but as I ran through the process over and over again I was also diving into a couple of books about the what was happening on a molecular level. From fermentation to distillation there is a lot of science involved, and yet since I am at the helm you know this process must be pretty forgiving. Fostering the ideal conditions for small molecular changes is obviously a challenge, but the more I deal with our large scale lab experiments the more I realize it is an art. There happens to be room for a lot of artistic interpretation, and most of these seemingly precise reaction are actually extremely forgiving. That being said, don’t try this at home. To sum everything up: we are making porridge, fermenting it with yeast, and then boiling it over and over to capture the steam, which we bottle and sell. In a few more words: We use organic corn which has been flaked, and we cook it into a porridge. When it thickens and cools to the right temperature we then unravel all of the starches from the corn by adding barley (shipped over from Scotland) which contains an enzyme that turns starch into sugar. After it cools a little more we dump in some yeast and let it go to town doing what yeast does best: eating and being gassy. As the yeast uses the sugars as fuel it produces waste of alcohol and CO2. So we let the yeast sit there and create a fermented mash of corn and barley for 6-7 days. After that we strain out all of the solids, take the liquids, and boil them in our stills. Since alcohol boils at a lower temperature then water we can remove it from the liquid before anything else and condense in jugs. 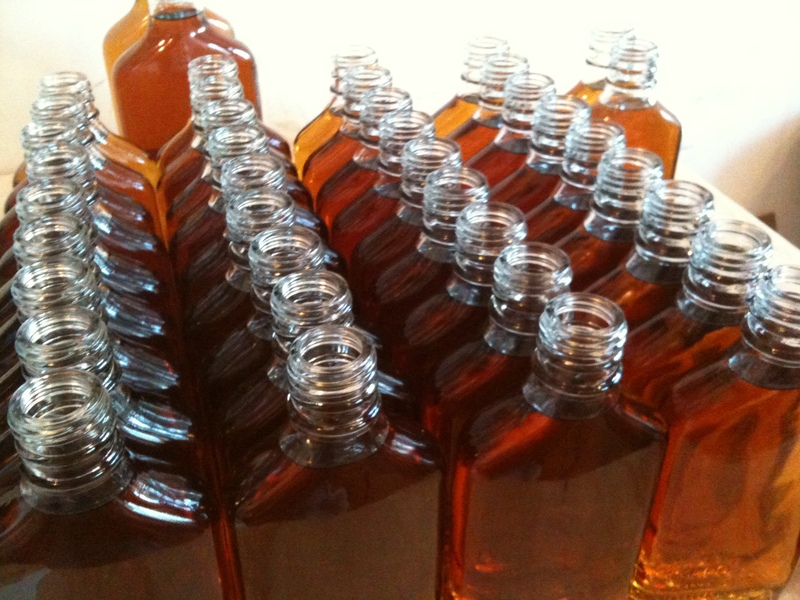 We repeat the boiling process again with the already removed alcohol for better purity and higher alcoholic content. 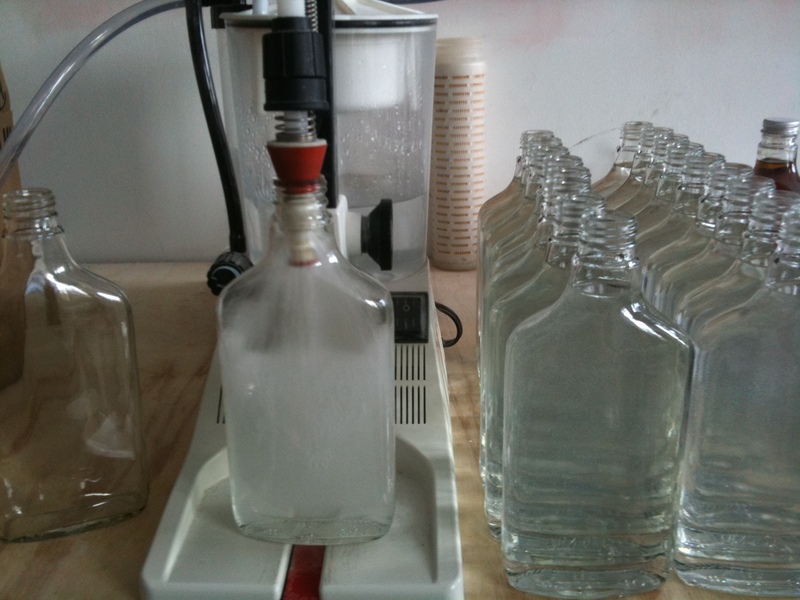 This comes out at 80% alcohol, which we dilute and put into casks to be brought out down the road. What this means for me: a lot of lifting! Carrying around jugs of fermented corn and barley. Stirring very large vats of boiling and sticky porridge. Carting around large wooden barrels filled with water. It is all very glamorous. The interesting part for me so far has been three fold: first, the process is fascinating. You can actually see each chemical reaction and change happen in front of your eyes. I take 15 gallons of corn mash (porridge) when it is thick and oatmealy and dump in 1/2 gallon of barley and within 1 minutes the enzymes from the barley have completely liquefied the entire mess, it transforms in front of your eyes from oatmeal to water. Second, the physical labor and crafting something tangible is extremely satisfying. There is something about working hard for 8 hours, being exhausted, but holding in your hand the fruit of your labors. There are few things more satisfying then creating from scratch. Third, I am alone at the warehouse in the deeps of Brooklyn by myself through the entire process. It has been interesting spending time on my own just working away, playing music and hauling around buckets. If you think I make a lot of noise when I am wandering around the house while everyone is home, try sticking me in a warehouse by myself for 8 hours. So that is it for now! I will continue this process day and night for quite some time. Soon enough the first round of bourbon and whiskey will be done aging in their casks and we will begin to fine tune their flavors, which is something I am very much looking forward to. The casks are charred on the inside.